If you read this blog with any regularity, you know I love the complicated, kind of alpha bad boys (Terrible, Rhys, Prince Ash, Mal). So, it’s a little surprising that the first time I read Frostbite, I found Adrian’s cocky, entitled attitude less than appealing. Oh, and calling Rose ‘little dhampir’? I thought it was patronizing. This time though, I loved him from the get-go. The edges of my mouth quirk up just typing his pet name for Rose. Knowing the characters better makes it so much easier to understand his actions. Frostbite finds Rose, Dimitri, Lissa and the rest of the St. Vladimir’s group heading to a Moroi ski resort for the holidays. Not just a few people, but the entire school goes there as a safe place as Strigoi attacks are emerging in new ways, and not far from campus. The majority of the novel is character development — specifically, Rose beginning to grow up. There are hints at what’s to come in Shadow Kiss, but Frostbite doesn’t have near the foreshadowing as the series opener did. 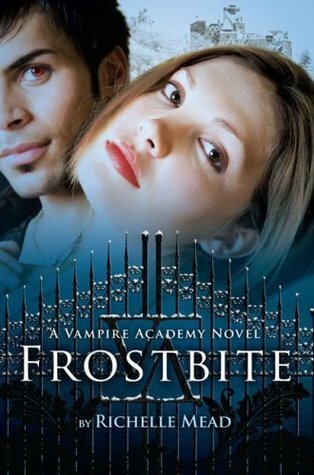 In summary, Frostbite was a thoughtfully played out exploration of Rose … as a character and a deeper plunge into the world of these people. It was like a piece of metal bended and stretched in one of those lab tests to figure out what it could actually do. And then once that was exhausted, it was tested with other elements to check the reactions. Maybe I’ll start calling this book the ‘Lab Experiment’. – Emily K.
I love the fact that the story always keeps you going and engaged. The only thing that I really don’t like about the story is Rose keeps meeting all of these guys. Granted she’s only interested in one of them, but they keep trying to win her over and it gets a bit old. I really liked that this book really showed what kind of danger the Moroi are really in. – Kim H.
Your turn: What did you make of Frostbite? Did you like the introduction of other guys? How did you handle the big scene in Spokane? Can’t wait to read more of the series! I Agre that Adrians Intro to the series lightened up the suspense of the Spokane abduction afterwords. Rose is lucky to have many suitors. she is strong and independant.But still young to where she has’nt learned whwt love is. Dimitri is her 1st big love but he is unattainable, Because of age and Tasha as a love interest.